"U2 albums never get finished"
U2 had hoped to release their newest album, tentatively titled No Line On The Horizon, by now. But things aren't always Swiss-timed for the mercurial Irish superstars. Having spent the past year tracking in their Dublin studio with longtime producers and collaborators Brian Eno and Daniel Lanois, U2 are now in London mixing the disc they say could be out in February. The Edge spoke to writer Danny Eccleston about how the band approached recording. He talked about his new favorite piece of gear and how it was changing his guitar sound - and inspiring songs, And he hinted that nobody should get too familiar with the album's title. Is the album still going to be called No Line On The Horizon? "It's not totally firmed up but it's still the working title. Our work process is all about allowing inspiration to arrive at any time during the process. There's no formality, until it's in the shops. U2 albums never get finished; they just get released." Has anything survived from the first bout of sessions [from September 2006], the Rick Rubin material? "We laid all that stuff to one side. Really out of deference to Rick and that set of songs we just said, OK, that's that, and we drew a line. So none of the Rick material went into this project. "We just felt like we wanted to put off the decision about what kind of record we wanted to make. And then we went in with Brian and Danny...and suddenly there was this excess of stuff, ideas...and we just thought, OK, this is clearly where we are at our most potent." "It sounds like a U2 album but it doesn't sound like anything we've done before." How would you describe the overall personality of the new album? "One half is songs that came virtually fully-formed...just the raw moment of creation. The other half is material we've kicked around a while...It sounds like a U2 album but it doesn't sound like anything we've done before." "Guitar is such a versatile instrument, but it's easy to get in a cul-de-sac of how it sounds." "It's this particular kind of 21st Century distortion. Guitar is such a versatile instrument, but it's very easy to get in a cul-de-sac in terms of how it sounds. I love anything that just gives it a different personality and this particular set of distortion pedals I think, are a different colour. "I used Death By Audio's Supersonic Fuzz Gun on the song No Line On the Horizon, and a couple of others I think. It was Ben Curtis who turned me onto them. He's one of the Curtis Brothers from Secret Machines." Having heard the myriad of sounds available from the Death By Audio Supersonic Fuzz Gun, MusicRadar is already excited to hear what creative uses The Edge has found for this crazy-mad pedal. Can't wait for February...if it is indeed February. 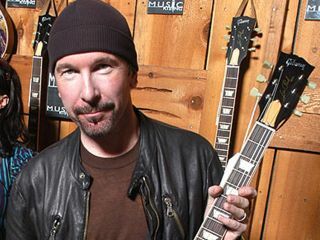 To read the interview with The Edge, visit the Mojo website.